"[A] videogame based critical design piece examining the constrained link between videogames and their players through the manual interface of the game controller, while referencing elements of lofi computing aesthetics through its visual and auditory feedback mechanisms." "By using a low fidelity reproduction of the hand in the playfield, both visually and in terms of the available control scheme, the game reflects the resolution divide between the analog and digital worlds. In addition to the challenge provided, the increasing button count of the onscreen game controllers is intended to reflect the evolution of game input devices. The final level of CONTROL confronts the user with the speculative ‘OctoPad’ prototype game controller that exaggerates the complexity of existing devices. The progress a player makes through the game levels is a measure of their own patience and ability to play within a constrained control scheme and increasingly more difficult level layout." 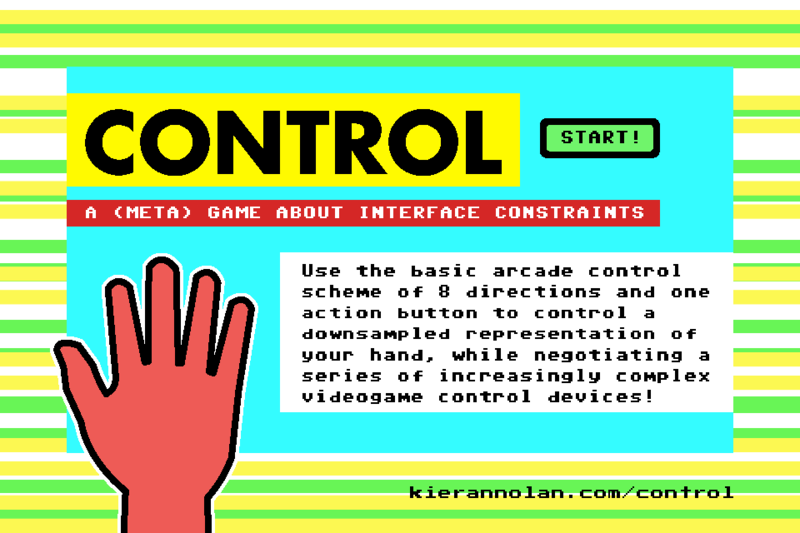 CONTROL is part of the (priceless) Experimental Game Pack 01 Compilation from LA Game Space. Also recommended: Nolan's C64 glitches.